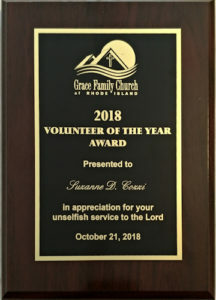 For several years, Grace Family Church of Providence, RI (a GCI congregation) has sponsored a Volunteer of the Year award, presented to residents of the community where the church meets who have distinguished themselves in unique ways in service to the Lord. The congregation recently announced that the recipient of the award in 2018 is Suzanne D. Cozzi, wife of the congregation’s pastor, Luciano Cozzi. Several guests from the community attended the service (below, left) where the award (below, right) was given to Suzanne. 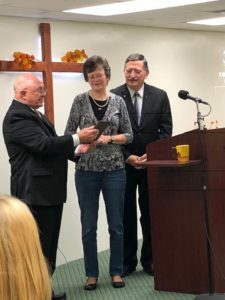 Though she had to leave gainful employment a while back due to cancer, Suzanne never stopped helping and serving the church and the community. Now cancer free, she dedicates 30 or more hours each week to serving the church and its associated counseling center. 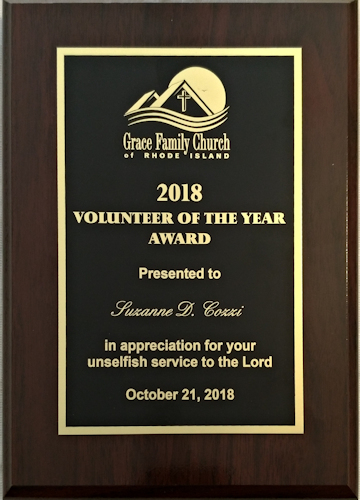 Though Suzanne’s example and service to the Lord has touched many lives in the congregation and the community, she has never asked for or expected acknowledgment or praise. For her, the privilege of serving the Lord is a sufficient reward. Suzanne’s sterling character as a woman, mother, wife and servant of the Lord shines brightly as a testimony to God’s grace and love. Congratulations Suzanne. My wife and I send our congratulations on to you for your dedication and commitment to so many and for doing such a long term service of helps to touch lives in such a positive way. Thank you for being such an example for us all! Sincerely, David and Linda Husmann. Thanks so much for being such a shining Christian example. Your dedication motivates and inspires all of us to keep our focus on that which is truly important. May the love you have shown to so many be returned to you a thousandfold. Blessings, continued prayers & appreciations…. Suzanne, thanks for exalting the Lord in your community. The light of Jesus shines brightly when Christians are moved by God’s love by serving. May you be blessed as you continue to be God’s conduit for blessing others. Hi Suzanne, good to see you and Luciano looking well and still doing what you do! Love Blessings in His Name. How far you two have come since we were attendees together in Auditorium A.M. in Pasadena! It’s great to have awareness of your progress in serving God’s people and your community. In the face of personal health crises, you have excelled, Suzanne. I’m proud of you! Suzanne, great to hear of your continued service and example in the Lord! Good to see you and Luciano and we remember your lovely friendship from College days. The Lord bless you and keep you both well.